The Djubi game (pronounced joo-bee) must be coolest way for kids and adults alike to play catch! The innovative sling shot design launches the balls up to 100 feet and the net makes catching look easy. After seeing some kids playing this game at the beach I had to go and ask them what it was. I can tell you that it was just as much fun as to play as it looked. I love that the creators of Djubi and Ringstix are inventing fresh ideas to the classic game of catching. The Djubi game may seem simple but it takes some practice to get the ball where you want it. You are essentially using playing catch with a slingshot and a large net. Start by aiming your racquet towards the target, and then pull the ball back and send it flying. Each Djubi racquet has a hook. The elastic from the balls hook onto the hook on the racquet. When pulling back the elastic and letting go it sends the ball flying easily up to 100 feet. To catch the ball simply place your racquet (net) in front of the incoming ball. The deep net easily catches the ball making for impressive moves. 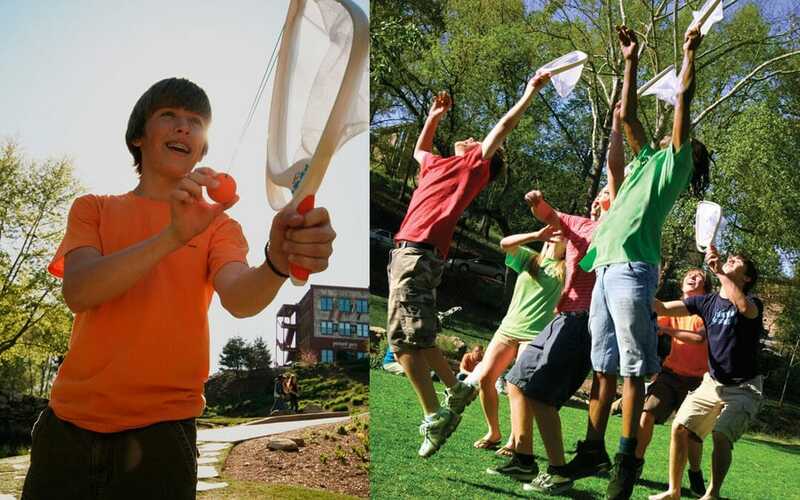 Take turns catching and releasing the Djubi ball or making up your own rules for hours of outdoor fun. Each Djubi set includes 2 racquets (or nets) and 2 balls. Each of the racquets have a launching hook and large catching net. This is a game set where you will probably want to get an extra set of balls because they get lost easily. Our main complaint with this game is the quality of the elastic bands on the balls. To send them far you pull back far sometimes breaking them. There are 2 versions of the Djubi product available, the classic and the junior. The largest difference between the 2 is the Junior is made for kids under the age of 8 years old. It’s smaller so it works well in smaller hands and adds a EZ-launcher component to make launch of the Djubi ball easier and not as far. See below for the best deals on the Classic and Junior Versions as well as replacement balls. We would have to say that Djubi is the coolest new way for kids to play catch. When we bought this for a friend’s kids birthday party and watched in laughter, and a little terror. The children were 11 years old and thought it was fun to shoot it over the house while we were in the backyard at the pool. Children under 8 years or so should have supervision but is another family friendly game that is part of our backyard game collection. There is a bit of an art to getting it just right to accurately land in your friends net but one of the reasons why people keep playing the game. Featured in our Ultimate Outdoor Games list. 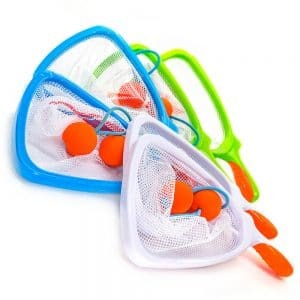 Get your sling on at the park, pool, camping or at the beach with your own Djubi Slingshot Game! Game description: Djubi Slingshot is a new and improved way to play catch! Playing with 2 people, and fling the Djubi up to 100 feet and have fun trying to catch it.